Make your dog’s veterinary check-ups more comfortable As the importance of dogs as companions in human life increases, so does the emphasis on pet health care. Just like feeding, grooming, walking and caring, visiting the veterinarian becomes an important part of your pet’s health schedule, simply because prevention is better than cure, especially for this caring companion of yours. 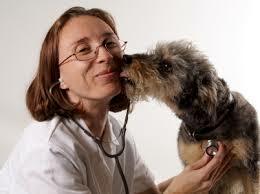 A vet within close proximity of your house, so as to facilitate multiple visits for treatments or emergencies. A vet who makes most pet supplies, accessories and emergency medication available at hand. A vet with a good reputation for availability, ability and responsiveness, since it is rather frustrating to wait for a vet’s appointment when your pet is really sick and needs immediate attention. Routine once-a-month health check-ups are a must for every household pet. If you have just acquired a new pet, you must take her to the vet immediately. Always seek a prior appointment and/or make sure the vet is in the clinic before leaving with your pet. Always make sure you are carrying along health card, vaccination card and other treatment record files of the pet. A vet’s clinic is often, visited by pets suffering from common viral or bacterial diseases that can be easily passed on to your pet, so for safety, keep your pet in the car/vehicle till it’s your turn to go in. Make it a habit to carry a well-fitting muzzle for your dog instead of using the one, which is at the vet’s clinic, since it has been obviously used on several other dogs and may be a carrier of bacteria or viruses. If your pet is an unvaccinated pup and is visiting the vet for the first time, do not let him sniff, snoop or lick around the vet’s clinic since it is easy for the unvaccinated pup to catch a fatal virus. Preferably, keep the unvaccinated pup in your arms and do not keep him down except on the clean table. One can never overlook the importance of history and evidence in vet’s practice. Simply because the patient cannot communicate and the vet has to rely on the history and clinical symptoms to reach a perfect diagnosis. As a pet owner, do not hesitate to give your vet the detailed history because sometimes even the silliest of the clues can provide the vet with a clue to arrive to a definitive diagnosis. The simplest of the routine check-ups should include recording of pulse, temperature, respiration pattern auscultation and palpation of all superficial lymph nodes. An eye, ear and oral mucus check for anaemia and/or dirt or infection. Routine check-ups will make your pet get used to handling by his vet. Pets who are brought to the clinic just once a year for the annual shots are more difficult to handle and uncomfortable even for performing simple routine operations like nail clippings or ear cleaning simply because they are not used to it. Therefore getting your pet used to this idea of grooming and being examined is a must. Since the first impression is always a lasting impression in the memory of pups, try to make his first visit to the clinic a pleasant one. Avoid any injection pricks or painful procedures on the very first day, if possible. Festive season is now so near and Diwali is just round the corner. As a guardian you should not forget the needs of your companion who takes care of you so well. Oh yes, I am talking about the dear member of your family- your dog! Festivals bring in a lot of joy and celebration. In the midst of all these pomp and show, we sometimes forget about the safety of our canine friends, which becomes all the more important during this time. As you are aware, dogs hear so well. They can differentiate between the noises of engines of two cars of same make and prick their ears when their master’s car arrives – a feat impossible for most of us. They can hear about 40 times better than us. So now we know, our canine friends can hear the noises or sounds beyond our capacity and have a very wide spectrum of hearing. They can be greatly startled by the noise of crackers burnt long distance away. We all should behave responsibly and avoid the noisy crackers completely. What disturbs our pets mostly is the loud music. As common sense prevails what troubles humans is hell for pets. There are loudspeakers everywhere during festive season, which contribute to the heavy sound pollution. These are the circumstances that need to be controlled. I have seen cases of dogs hiding as noise levels become higher and that is very traumatic for them. Dogs tend to stay away from their homes when frightened, hence, it becomes important to ensure they are safe and secure. Some dogs can get very nervous and try to chew on things or bite people or even their owners on the slightest provocation during such times. I have also encountered cases of dogs attacking live crackers trying to take them in their mouth, biting the crackers and getting burnt in the process. Always remember that crackers can cause fear, aggression or mental depression in dogs, so keep your pet monitored at all times. I even came across a case where a puppy chewed on the ornaments kept in front of deity during worship and ‘ate’ them. The guardians of the dogs could not understand where the ornaments disappeared until I suggested having the puppy X-rayed. So be careful on this issue as well. Do not give sweets or fried, spicy foodstuff to dogs as it can upset their stomach. Do not shift from normal feeding practices. Do not keep sweets in the box open as your lil’ one can eat the whole lot and get sick. Phosphorus? : Use when the dog is easily startled by noise and leaps suddenly when you drop something. Borax? : Use when the dog startles greatly even if the noise is a long distance away. Aconite? : Main fear remedy. Use when responses are rapid and violent. Use doses in low potency- 3x, 6x, 3c, or 6c. Ayurvedic: Mentat syrup (Himalaya drugs) or Anxocare syrup (veterinary formulation) 1tspfull three times a day or a tab each of medicines mentioned above is recommended as a behaviour modifier, anxiolytic and mood elevator. Dr. Aradhana Pandey is a regular blogger for dogs and pups magazine, she gives tips for the well-being of your four-legged new member of the family. To keep a pet is to commit oneself to his care. You should be aware of certain tips required for the well being of the new life you have added to your family. Pets Feeding Tips – Like a small child, a pup needs to be fed at short intervals. An interval of 4-5 hours is good enough to begin with that is to be increased as the pup grows. The suggested pets feeding time as per the age is as below: The frequency of feeding, however, may slightly vary as per the breed type. A pup’s diet should be rich in protein and fats, apart from having sufficient energy, hence adequate provision should be made to fulfill the need of your pets nutrients. Most of the pups cannot digest milk, hence it can be avoided in case of problem. Instead, curd can be included. Best Supplements for Your Pets – To cope up with the growth requirement, the pet needs diet rich in minerals (especially Calcium and Phosphorous), vitamins and fatty acids. If diet is low in these elements, additional supplementation is recommended to fulfill the need. Smart Way to Groom your pets – A pup should be kept neat and clean. After consulting your vet, pups can be bathed at a gap of every 1 month. To keep pup clean and free from infection, regular brushing or combing is a must. Once in a while, flea comb should be used to check flea infestation. Antiseptic/antimicrobial dusting powders can be used to check skin affection/allergy. Trimming of hair from the front of eyes will prevent eye problems. The grown up puppy (especially short hair) should be massaged to improve the skin health. Puppy Bedding– Provide him with a space of his own, baskets/beds of various sizes are available. Right from the very first day he must identify where he is supposed to sleep. To make him acquainted with his bedding, put his toys and chewing objects on his bed. Puppies Dental care – Dental cleaning should be started from an early age so that the pup gets used to it. Various options in form of paste, spray and gel are available. If not routinely cleaned, the teeth may develop problems in later stage of life. Ear cleaning– Dogs’ ears develop a lot of wax that needs to be regularly cleaned otherwise it serves as a good medium for infectious agents. Pups should be made accustomed to ear cleaning otherwise he may not co-operate when grown up. Various cleansing agents are available in the market and can be used on the advice of the veterinarian. Pets Vaccination– The pup should be duly vaccinated for all the important diseases which could otherwise be life threatening. The vaccination schedule can be procured from the vet and should be strictly followed. The major diseases from which the dog is to be protected are– Parvo virus, Canine distemper, Rabies, Leptospirosis, Canine Influenza, Infectious canine hepatitis and Corona virus infection. The vaccination schedule is to be annually repeated after the initial shots. The vaccines are very safe if given in a stress-free and healthy animal. Security – Pups should be kept in a secured place wherein the chances of theft, accidents and poisoning are nil. Young pups have a habit of scavenging everything. Also they love to run away from home to explore the outside world. These conditions can turn to be very serious for the pup. Also there remains a possibility of road accident, as pups may not have road sense. At the same time, pup should not be kept locked in a room or crowded messy place. A over restrained pup will not grow as a healthy and disciplined dog. Puppy Exercise Time– A pup should start with a gentle exercise in the courtyard of the house. This may finally take the shape of a rigorous exercise when he approaches adulthood. The transition phase should be simultaneous so that undue pressure on the joints and muscles is prevented. An exercise in the soil surface is always better than the exercise on a hard surface. Prevention from ectoparasites– Pups may catch ectoparasites (ticks, lice and fleas) from their environment. Hence, it should be ensured that the place where pup is kept or taken should be free from ectoparasitic infestation.